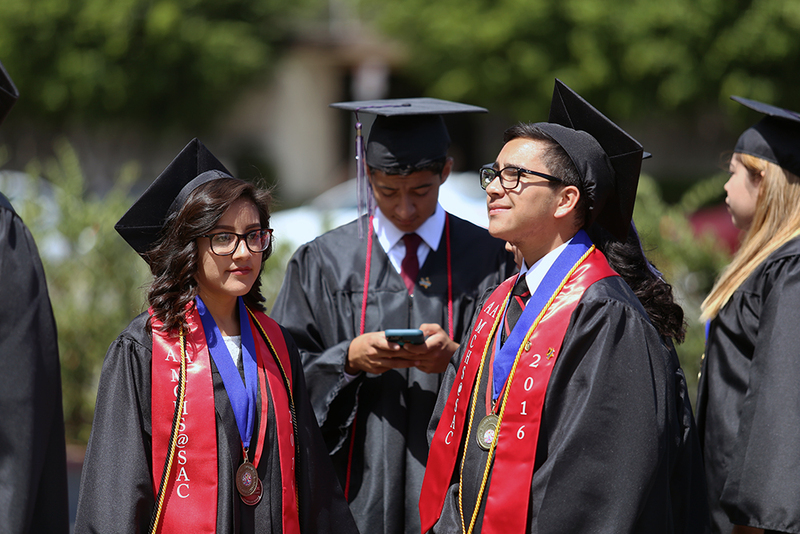 Santa Ana's Middle College High School graduates from the class of 2016. California’s high school graduation rates may not be as high as those published by the state, at least as measured by regulations set by the federal government. That’s one of the conclusions of a federal audit of data from the 2013-14 school year released this week that raises multiple questions about the accuracy of California’s published graduation rates. The January 11 audit report by the Office of the Inspector General in the U.S. Department of Education charges that the California Department of Education did not exercise sufficient control over how local districts and charter schools gathered data on graduation rates, and which students were included in their calculations of the rates. Last year, the California Department of Education announced that the state’s 2016 graduation rate — essentially the proportion of 9th graders who graduated within four years — had reached an all time high of 83.2 percent. In a detailed rebuttal to the audit, the California Department of Education concurred with some of its findings but not with others. The audit, which only looked at data and records from the 2013-14 school year, sampled a small number of students in the Los Angeles Unified School District, the state’s largest, and the far smaller number of schools run by the Los Angeles County Office of Education and Baldwin Park charter schools. In some cases, the audit said that students who had transferred to an adult education or a community college, and earned an adult education high school diploma or a certificate of proficiency were counted as graduates when they should not have been. If these students had been excluded, the audit asserted that the state’s graduation rate in 2013-14 would have been 2 percentage points lower than the published rate of 81 percent, which mirrored the national rate. However, state officials said California considers an adult education high school diploma the equivalent of a standard high school diploma, while federal guidelines don’t take into account alternative diplomas of this kind. California was one of three states targeted for an audit of how it implemented federal regulations issued in October 2008 — during the final months of President George W. Bush’s administration — to calculate what is called “the adjusted cohort graduation rate,” or in the alphabet soup of federal education law, the ACGR. This rate, the audit explained, is reached by counting 9th graders in a particular school year and adjusting the number “by adding any students who transfer into the cohort and subtracting any students who transfer out, emigrate to another country, or die.” The graduation rate is the percentage of those students who graduate within four years. Go here to read the full audit report and the response from the California Department of Education. California’s graduation rate, even adjusted down 2 points as the federal government suggests, has been steadily improving since 2010 and remains at an all-time high.